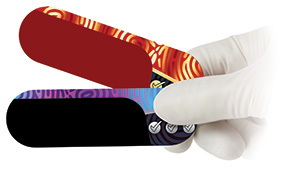 • Easy-grip handle eliminates the need for forceps. Bite-Chek is $17.95 per pack of 100. • Conveniently housed in a tray to make dispensing easier. • Thin, double-sided, 19-micron, articulating film. Bite-Chek articulation film from Microcopy boasts an innovative “easy-grip” handle to simplify occlusal adjustments without the need for forceps. 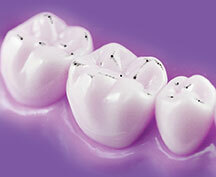 The patented design fits the contour of the mouth and easily reaches the back teeth. • Easy-grip handle requires no forceps. 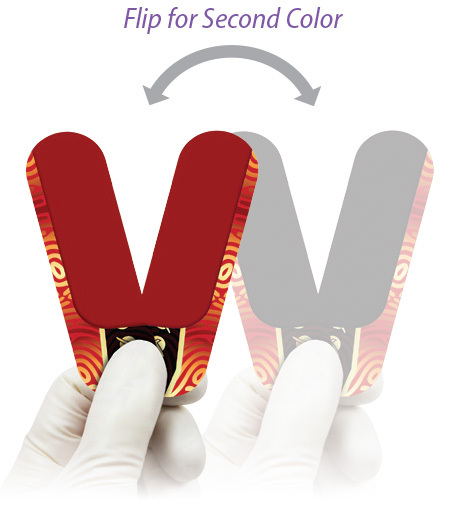 • Eliminates the risk of biting forceps. • No curling, handle holds film flat. • Handle keeps gloves clean. • Thin film marks high points accurately. • Film stretches without snap back or tearing to prevent false marks. • Film marks all surfaces: enamel, metal, non-metal restorations, and plastic. 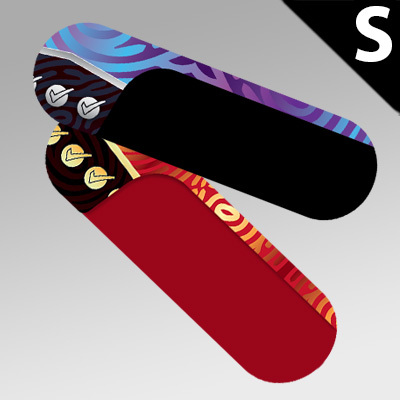 • Marks both arches at once with its double-sided film. • Can be used as a full-arch. Bite-Chek is available in double-sided Black/Black and Red/Black articulation film. The new Red/Black film makes it possible to mark both the occlusion and excursion. With the patented easy-grip handle, Bite-Chek is also used to mark the full arch by holding two side-by-side as shown. The angle can be adjusted to fit the width of the arch. Bite-Chek accurately marks the points of contact, minimizing the possibility of “too high” an occlusion and possible post-operative tooth sensitivity. 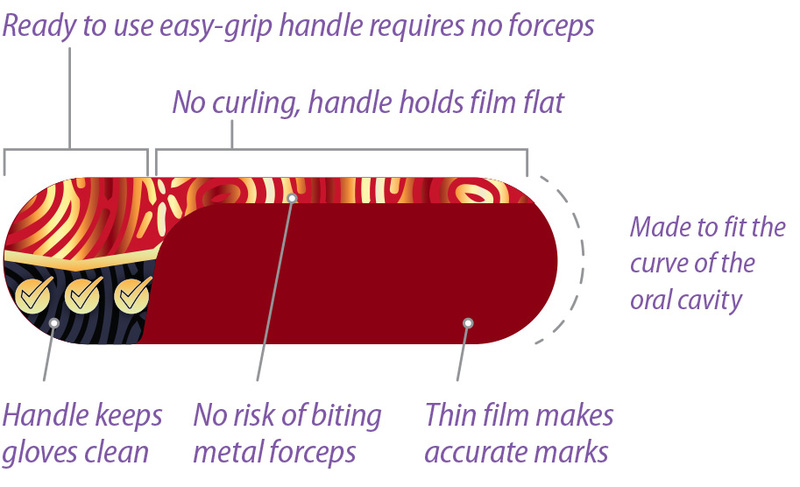 Contrary to many thicker paper options on the market today, our film’s thin profile helps patients close their bite completely, eliminating mandibular reflexes that can skew the occlusion. The result is a small, accurate mark that makes adjustment easy to interpret. 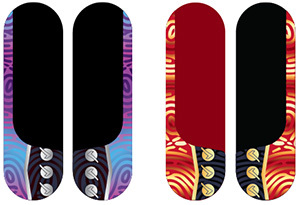 Thin 19-micron, double-sided Black/Black and Red/Black film marks both arches at once. 1. Dry the tooth surface. 2. Position the film on the teeth. Rx Only. These instructions, in whole or in part, are not a substitute for formal training. Appropriate professional education is STRONGLY RECOMMENDED prior to using this device clinically. Bite-Chek is made up of layers of laminate, ink, paper, medical grade adhesive, and coated film. It is to be used by qualified dental practitioners in dental clinics, hospital, lab, or schools for a dental application. Articulation film is a non-invasive device that can be used on children, adults, adolescents, or animals. Product claims to mark occlusal surfaces or contact points. It is offered as not sterilized; however, it is packaged in a controlled environment. Product is single-use and should NOT be re-processed and/or re-used. Bite-Chek is an articulation film product made to mark the occlusal surface of the mouth. Marking surfaces can include zirconia, porcelain, composite, gold, eMax, or stainless steel. Use of Bite-Chek is contraindicated on any patient who is allergic to any of the components of the product. Do not reuse. The Bite-Chek are single-use. a) Carefully read package labels to ensure use of the appropriate device. b) Failure to follow instructions may cause procedural delays or patient or user injury. c) Prior to use, carefully inspect the product for signs of damage and/or deterioration. d) Discard any damaged Bite-Chek immediately. e) Bite-Chek are for SINGLE-PATIENT-USE ONLY, in a dental setting. f) Discard immediately after use. g) Always keep track of Lot Numbers of Bite-Chek to ensure traceability. h) Used by a trained dental practitioner, assistant, or hygienist. Bite-Chek should be stored in a dry, dust-free environment, outside of direct sunlight. Improper storage conditions may cause malfunction of the product. Each package includes Lot number on its label. This number must be quoted in any correspondence regarding the product. Lot Code Indicates the manufacturer's batch code so that the batch or lot can be identified. Consult instructions for use Indicates the need for the user to consult the instructions for use. CE marking Signifies European technical conformity. Do not use if package is open or damaged Indicates a medical device that should not be used if the package has been damaged or opened. Bite-Chek is tested by Clinician Report's Evaluators and is highly rated in 2015. Bite-Chek received Dentistry Today's Top 100 Products Award for 2015. Try Bite-Chek to see how to simplify occlusal adjustments. Click here to request a Free sample. "This is a "why didn't I think of that?" product. It is a simple solution executed to perfection. Congrats!" "Liked the product. Very convenient." "Great product. Really nice, marks well." "Great for quick occlusal issue checking. Doesn't require forceps, thin film. Like that the tooth can be wet." "Bite-Chek has good quality marking on all surfaces wet or dry." "Bite-Chek is a wonderful new product. It has simplified articulation immensely!" "Love Bite-Chek. Love the built-in handle. Great Price!" Easy-grip handle eliminates the need for forceps. Click for Bite-Chek..
Easy-grip handle eliminates the need for forceps.Red and Black film mark bo..